Everyone has some belly fat, even people who have flat abs. That's normal. But too much belly fat can affect your health in a way that other fat doesn't. Some of your fat is right under your skin. Other fat is deeper inside, around your heart, lungs, liver, and other organs. It's that deeper fat called "visceral" fat that may be the bigger problem, even for thin people. You need some visceral fat. It provides cushioning around the organs. But if you have too much of it, you may be more likely to get high blood pressure, type 2 diabetes, heart disease, dementia, and certain cancers, including breast cancer and colon cancer. The fat doesn't just sit there. It's an active part of your body, making lots of nasty substances. If you gain too much weight, your body starts to store your fat in unusual places. With increasing obesity, the regular areas to store fat are so full that the fat is deposited into the organs and around the heart. The most precise way to determine how much visceral fat you have is to get a CT scan or MRI. But there's a much simpler, low-cost way to check. Get a measuring tape, wrap it around your waist at your belly button, and check your girth. Do it while you're standing up, and make sure the tape measure is level. For your health's sake, you want your waist size to be less than 35 inches if you're a woman and less than 40 inches if you're a man. 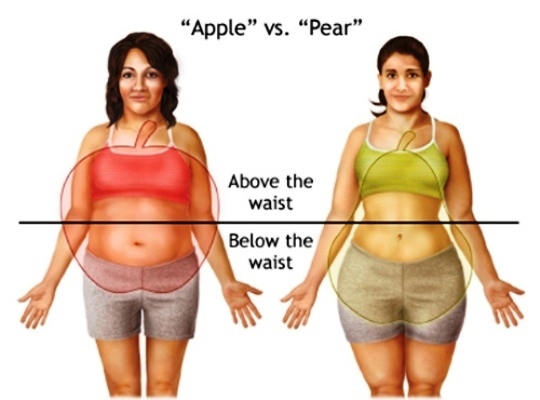 Having a 'pear shape' - bigger hips and thighs - is considered safer than an 'apple shape', which describes a wider waistline. If you have more abdominal fat, it's probably an indicator that you have more visceral fat. Even if you're thin, you can still have too much visceral fat. How much you have is partly dependent on your genes, and partly on your lifestyle, especially how active you are. 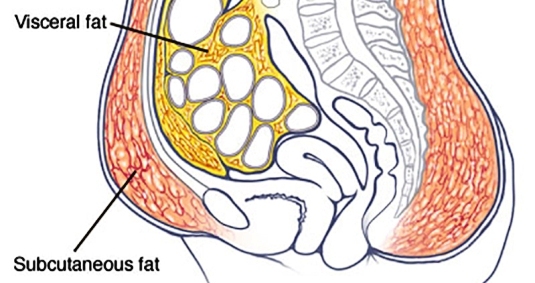 Visceral fat likes inactivity. In one study, thin people who watched their diets but didn't exercise were more likely to have too much visceral fat. 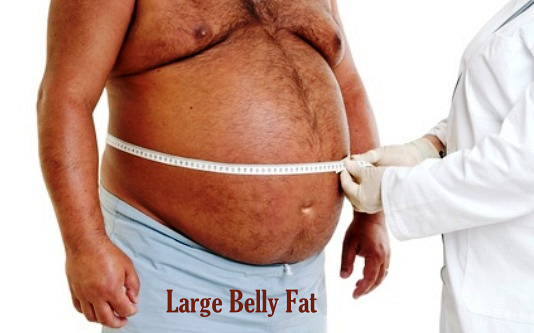 The key to lesser visceral fat is to be active, no matter what size you are. There are four keys factors in the control of belly fat namely: exercise, diet, sleep and stress management. Get at least 30 minutes of moderate exercise at least 5 days a week. Walking counts, as long as it's brisk enough that you work up a sweat and breathe harder, with your heart rate faster than usual. To get the same results in half the time, step up your pace and get vigorous exercise - like jogging or walking. You'd need to do that for 20 minutes a day, 4 days a week. Jog, if you're already fit, or walk briskly at an incline on a treadmill if you're not ready for jogging. Vigorous workouts on stationary bikes and elliptical or rowing machines are also effective. Moderate activity - raising your heart rate for 30 minutes at least three times per week also helps. It slows down how much visceral fat you gain. But to torch visceral fat, your workouts may need to be stepped up. "Rake leaves, walk, garden, go to Zumba, play soccer with your kids. It doesn't have to be in the gym. If you are not active now, it's a good idea to check with your health care provider before starting a new fitness program. 2. Diet: There is no magic diet for belly fat. 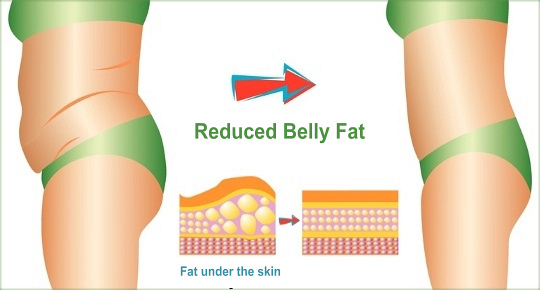 But when you lose weight on any diet, belly fat usually goes first. Getting enough fiber can help. Hairston's research shows that people who eat 10 grams of soluble fiber per day, without any other diet changes build up less visceral fat over time than others. That's as simple as eating two small apples, a cup of green peas, or a half-cup of pinto beans. "Even if you kept everything else the same but switched to a higher-fiber bread, you might be able to better maintain your weight over time". 3. Sleep: Getting the right amount of shut-eye helps. In one study, people who got 6 to 7 hours of sleep per night gained less visceral fat over 5 years compared to those who slept 5 or fewer hours per night or 8 or more hours per night. Sleep may not have been the only thing that mattered but it was part of the picture. 4. Stress: Everyone has stress. How you handle it matters. The best things you can do is to practice relaxing with friends and family, meditating, exercising to blow off steam and getting counselling. That leaves you healthier and better prepared to make good choices for yourself. If you could only afford the time to do one of these things, exercise probably has the most immediate benefits, because it gets at both obesity and stress. You may simply need to include somewhat more fluid if the smoothie is getting too thick for your blender to prepare.